We’ll take a slight detour from my college readiness manifesto (that hasn’t even really started yet) to bring you the following election-related problem. Then again, this problem was lifted directly from a graduate level Statistics class, so this might give some insight into what college readiness could potentially look like. Hadn’t thought of that. Enjoy! The US presidential election of November 7, 2000, was one of the closest in history. As returns were counted on election night it became clear that the outcome in the state of Florida would determine the next president. At one point in the evening, television networks projected that the state was carried by the Democratic nominee, Al Gore, but a retraction of the projection followed a few hours later. Then, early in the morning of November 8, the networks projected that the Republican nominee, George W. Bush, had carried Florida and won the presidency. Gore called Bush to concede. On the way to his concession speech, Gore then called Bush to retract that concession. When the roughly 6 million Florida votes had been counted, Bush was shown to be leading by only 1,738, and the narrow margin triggered an automatic recount. The recount, completed in the evening of November 9, showed Bush’s lead to be less than 400. Meanwhile, angry Democratic voters in Palm Beach County complained that a confusing “butterfly” ballot in their county caused them to accidentally vote for the Reform Party candidate Pat Buchanan instead of Gore. See the ballot below. You might understand how one could accidentally vote for Buchanan instead of Gore because Gore’s name is the second listed on the left side, but his “bubble” is the third one. Two pieces of evidence supported the claim of voter confusion. First, Buchanan had an unusually high percentage of the vote in that county. Second, there were also an unusually large number of ballots discarded during counting because voters had marked two circles (possibly by inadvertently voting for Buchanan and then trying to correct the mistake by then voting for Gore). 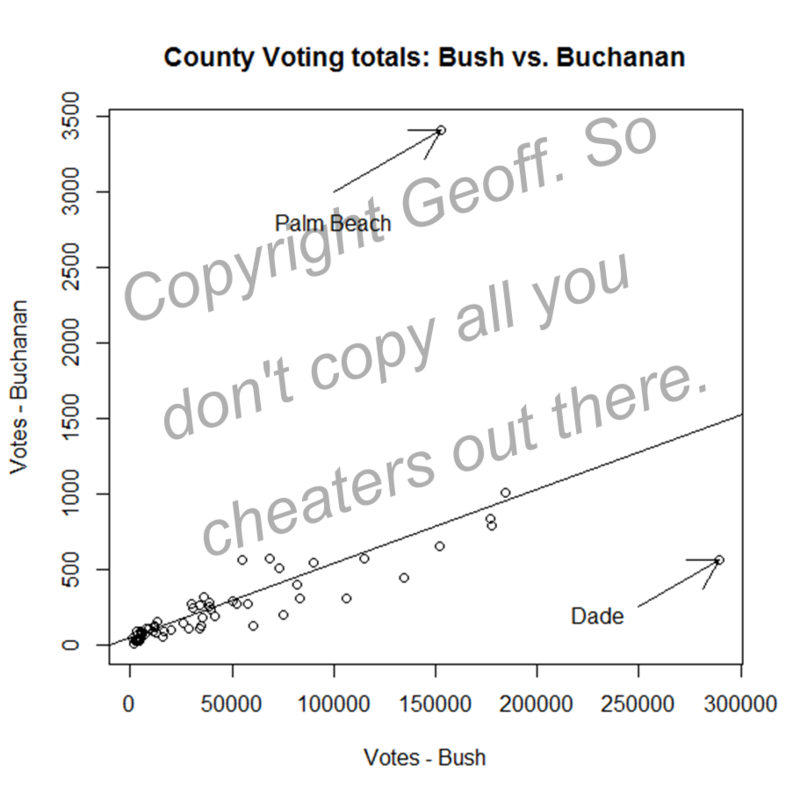 Make a scatterplot of the data, with X = # of votes for Bush and Y = # of votes for Buchanan. What evidence is there that Buchanan received more votes than expected in Palm Beach County? Analyze the data without Palm Beach County to obtain an appropriate regression model fit. Obtain a 95% prediction interval for the number of Buchanan votes in Palm Beach County from this fitted model (assuming that the relationship between X and Y is the same in this county as the others). If it is assumed that Buchanan’s actual count contains a number of votes intended for Gore, what can be said about the likely size of this number from the prediction interval? The US presidential election of November 7, 2000, was one of the closest in history. As returns were counted on election night it became clear that the outcome in the state of Florida would determine the next president. When the roughly 6 million Florida votes had been counted, Bush was shown to be leading by only 1,738, and the narrow margin triggered an automatic recount. The recount, completed in the evening of November 9, showed Bush’s lead to be less than 400. 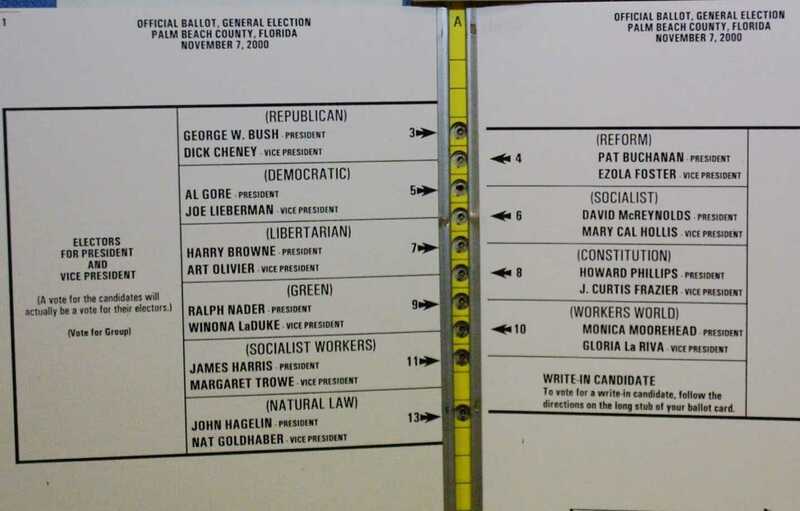 Meanwhile, angry Democratic voters in Palm Beach County complained that a confusing “butterfly” ballot in their county caused them to accidentally vote for the Reform Party candidate Pat Buchanan instead of Gore. See the ballot below. How could we use statistics to determine whether or not the “butterfly” ballot confused voters? How big of an outlier was Palm Beach county? Had the ballot been more traditional, can we predict the outcome of the Florida electoral votes (and presumably, the 2000 election?). Is there a model of sorts we could employ to detect such anomalies in the future? While we’re at it, what’s up with Dade County over there? Socratic discussion on outliers, not to be confused with Outliers by Malcolm Gladwell. Workshops on confidence intervals, standard deviation and the like. What does the line of best fit look like with and without Palm Beach? And what might that tell us about the voting discrepancies in Palm Beach? I’m not going to post my response to the problem prompt, because it may violate academic honesty or something. But I’ll post a scatterplot of Bush/Buchanan votes by county and leave it at that. Preparing Kids for College (A Prologue): Kids should go to college. The lack of a college degree is debilitating to a person’s work and career potential. The lack of work and career potential is debilitating to a person’s enjoyment of his or her life. So, what do you guys think? Hate me yet? The “you don’t have to go to college to be successful!” drumbeat is louder than ever these days, often from educators I respect and admire. But my admiration is tempered by the fact that I think this is a hugely damaging assumption. Kids should get as much education as they can. Formal education, with pieces of paper awaiting at the end at that. Before I continue further, I’d like to talk about my father-in-law a bit. My father-in-law worked for decades in the print business. Working probably 60 hours a week as a warehouse manager, he was and is a diligent and supremely competent worker. He’s also now chronically unemployed. As the print business he worked for shuttered its doors – because it’s the printing business – he began to search for similar work. He started his search locally, but eventually had to expand it to an hour-plus commute time. After several more months he had to expand his search to the entire country. Eventually, he found a position in Ohio that would take him, thousands of miles away. Why wouldn’t nearby businesses accept his application? Because he doesn’t have a piece of paper showing that he has a bachelor’s degree. That’s it. As you know, this economy’s kind of in the crapper right now and personally I have no reason to believe it’ll get substantially better any time in the near future. That’s a post for another day. My father-in-law was applying for living-wage jobs along with 50, 100, or 200 other applicants. But he never finished college. If you’re a business hiring for one position with dozens or hundreds of applicants, a college degree becomes the first filter to help whittle down that stack of paper. It’s not the way it should be, but it’s the way it is. The way things should be would include having all the applicants demonstrate their skills in some capacity – a trial employment or something like that. Had that been the case, my father-in-law would assuredly be able to pick whatever warehouse/printing/data management job he wanted. If you think a college degree isn’t a necessity in this day and age, I’d like you to talk to a chronically unemployed person. Or better yet, be there when he or she gets a rejection notice (although, truth be told, most businesses didn’t even bother sending a rejection notice). Tell them that having a college degree isn’t important when they’re sending out 20 applications in a week and hope to hear from just one. Tell them that they were right to not go to college when they give in and take a minimum wage job, after having worked for decades earning a comfortable annual salary. Yes, there are unemployed PhDs out there, but unemployment rates decrease steadily the more education you have. Even (especially) in this crappy economy. Yes, there are successful people that didn’t go to college. “Steve Jobs didn’t graduate college!” But if anything, those examples actually present more of an argument FOR going to college: if you want to be successful without a college degree, you’d better be as innovative as Steve Jobs, as tech-savvy (it’s always tech businesses) as Michael Dell. (Aside, I find it hilarious that this yahoo! article on CEO’s without college degrees includes Maverick Carter, who’s only qualification in life is “being LeBron James’s friend”). And please don’t tell me “I know a guy that fixes air conditioners that makes 60K a year and he never graduated college!” Unless you have a data set better than the above link from the U.S. Bureau of Labor Statistics, I will not accept your anecdotal data of people who are succeeding in their careers without high education. Yes, we want our students to be happy, and have a career they love, not just a job where they clock in. But the relationship between life satisfaction and employment (or, perhaps, the inverse) is undeniable. Happiness and employment are inextricably linked. Likewise unhappiness and unemployment are basically a proxy for one another. So, I basically reject these counter-arguments as, at-best, hooey, and at-worst, ignorant and destructive. However, I think there is merit to the following counter-argument: we do such a poor job of retaining and graduating students once they get to college. This is the fly in the pro-college ointment that I’m selling. The only thing worse than bypassing college entirely is going, then dropping out with student loan debt. Or going to one of those horrific, for-profit trade schools. I would submit though that once a kid has been accepted to a university, the onus of graduation then rests upon the university, not the student’s K-12 schools and teachers. Again, another post/another day, but if a university accepts a student based on their application, it is up to the university to graduate as many of those accepted students as possible. Moreover, the inspiration of this multi-part college readiness manifesto is to address just that: how to get kids college-ready. How do we ensure kids get the content knowledge as well as learn how to deal with the social and financial pressures associated with living on your own for the first time? What would a high school geared specifically toward college readiness look like? I’m not sure I’ll be able to come up with any concrete answers, but I’ll at least try to generate a few questions. Would taking English Composition 101 or Calculus 3 have helped my father-in-law in decades in the print business? Of course not. But having a college degree in the here and now would help him get a job that actually pays the mortgage and live near his grandchildren. As I said, this isn’t about the way things should be, it’s about the way things are. We are doing a disservice to kids if we tell them there are ample, well-paying job opportunities for workers without a college degree. Because that is a flat out lie. So I hope you’ll allow me some self-struggling for a couple weeks through this question of college readiness: why, what, and how?